Gift your pup (or friends who happen to be puppy parents) the chicest collar and leash set of them all. Not only are these dog accessories from Yark absolutely gorgeous, but they’re also super durable and will last a long time. Any animal lover would be thrilled to store her rings in this cute kitten dish from Catbird. And let’s be honest, anything that’s white with gold accents is automatically good by us. This ceramic French bulldog from our friends at Lulu and Georgia is a great gift for anyone on your list… but especially for your besties who have a furry friend of their own. For the pup who has everything… but seriously, how cute is this dog sweater from Club Monaco? It’s guaranteed to keep your pets warm (and oh-so-stylish) all winter long. We love a good pun here at LC.com, so when we saw this Sniffany & Co. dog toy, we knew it had to make the list. Any pet lover (and pet owner) can appreciate a gift that’s both necessary and makes for cute décor, like this adorable treat jar. Also, you’ll score extra points with your pal’s pup if you include some dog treats in there. Everyone can appreciate a great coffee table book. And this one is a must for any animal lover! In fact, our editor Rachel has this exact book styled on her coffee table right now. Once again, it’s nice to gift your friends (or your pets) something that’s functional, but also makes for cute décor. You get both with this chic and cozy dog bed by Jax and Bones. 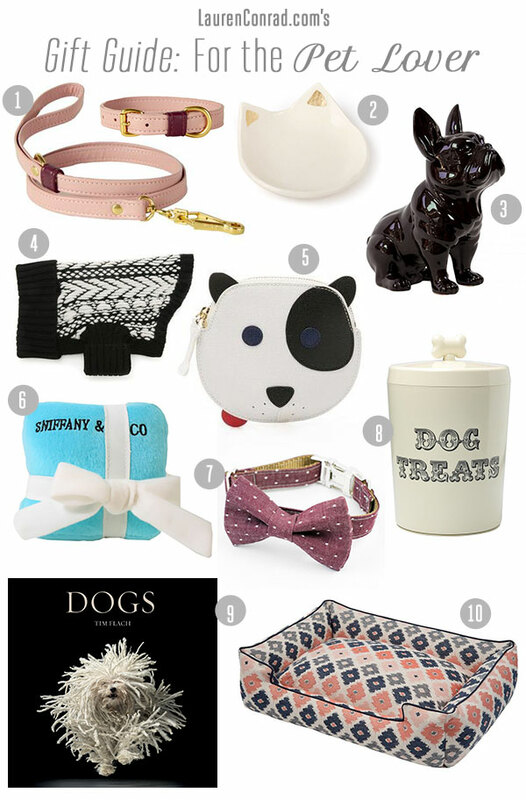 What will you be picking up for your pet-obsessed friends? And make sure to share this with any of the animal lovers in your life, too!